The newspaper headlines this week are packed with political tales of which party is promising the biggest tax cuts. I’m not an economist so you’ll forgive my ignorance I’m sure. Didn’t the world’s governments just throw trillions of tax payer’s money at the financial markets to prevent them from collapsing? Did I just dream that or something? Please correct me if I’m wrong about this but these trillions of dollars have to come from somewhere don’t they? The £500 billion that my government took to pay the banks so that tey could lend it back to us with interest, that came from the taxes that we pay doesn’t it. It could be direct taxation from income, taxation on the things we buy or taxation on business that produce things or sell services. Every time there is a transaction of some kind the state takes a cut. They use this money to pay themselves, keep the NHS functioning, pay for the two wars that we’re involved with, give cash to Europe, pay for unemployment and pensions, pay for roads, libraries, policemen and women, pay for social care of all kinds (we can see how well that is funded), education for our children, independent scientific research and a whole host of other things. Taking £500 bn of that money away means one of two things to me, as I’m not an expert at all. They will need to cut spending on all the publically funded things that they could have spent the money on. They’ve borrowed it and will have to pay it back with interest. This will mean that there will be less money to spend on publically funded things. I’m sure I’m going to just go out there nwo and put my ignorance on my sleeve for all to see. If there is less money in the pot to spend on things because it’s been spent already then doesn’t this mean that the state needs to recoup that loss in order to keep spending by raising taxes? Or reduce public services. One of the two. Surely? Reducing taxes will reduce the amount of money the government can skim and less money will be coming in to the public’s coffers. Have I got this wrong somewhere? OK, people will have more money in their pockets and so might spend more which will lead to more transactions where the state skims a bit off the top but if that is the case then why not cut the tax burden right down to nearly nothing and the country will be rich. We’ll have wonderful public services because we’ll all have cash falling out of our ears and the state will be there to pick up our scrappings. I suspect that it is a Big Lie to get votes. Come on politicians, you can be honest with us, we’re not stupid. We understand that things might be tough and we might be a bit skint for a bit, tell us that and let us bite the bullet now so we get it over with all the quicker. Honestly, we’ll thank you for it in the end. A Big Lie just makes us distrust you all the more. So, stop that. Stop it at once. It can’t be that easy? What have i missed? Helen talked about rudeness in her blog. Apparently 80% of Bloody Colonial Yanks think that rudeness is a problem in America. Clearly they know nothing and haven’t a candle to hold to we Brits. We’ve got rudeness down to an art form. Why, I can insult someone to their face with such aplomb that they will believe I have blessed them before all the Celestial Bureaucracy. I can turn the phrase so that they weep bitter tears hours or even days later when it dawns on them how I have abused them. All English people have this skill. We learn it in the playground and from our parents. There are no compliments just one half of an insult left unsaid. We are masters. Yet, our Norman cousins surpass even our skill. The noble French, so brave in battle, are kings and queens of the sneer. A look from a Frenchman can convey more contempt than a English verbal parody and a snort of disgust can be exhaled with such venom that the target might keel over in shame. We have much to learn. But not as much as Americans. What is your favourite method of insulting someone? It might be a favourite phrase or sound or an absence of action. Mine is the blank stare for a moment too long followed with a short “Huh?” I enjoy the way that they doubt themselves, was their explanation weak or did they mumble? It is effortless as well. I’m also quite keen on the phrase “I’m sorry, I stopped listening” but this is a tad obvious. Tell me yours please. In the interests of science. Anyone who knows me can tell you that I have a head full of crap and it occasionally spills out when I talk. a head full of crap (not literally, don’t be vile) means that I tend to accumulate useless information that I can regurgitate at will. Poppy Day is today and I thought I’d share some useless information about it. You probably won’t find it interesting but there’s always the chance that you might. The cornfield poppy grows wild in Belgium and northern France. It is a prolific plant. Poppies were carried back by servicemen in great numbers after the Great War and grown at home. Ex-servicemen sold these flowers to supplement their incomes. It was particularly common for the war wounded, the disabled and injured to do this if they could not work. It must also have been helpful for those with mental scars as well as physical ones. For years the poppy grew to become synonymous with the old soldier until, in 1921, the Royal British Legion was formed. They began to use artificial poppies for fund raising and the home grown supplement for the old soldiers was replaced by organised charity. White poppies are for the peace movement who object to war and black poppies are to support people recovering from drug abuse. Not all poppies can be used to produce opium which is quite important if you were to want to start up a home grown drug trade. Really, it’s not worth the hassle. Fighting erupted between Greek Orthodox and Armenian monks at the Church of the Holy Sepulchre, the traditional site of Christ’s crucifixion. Shocked pilgrims looked on as decorations and tapestries were toppled during Sunday’s clash. Dressed in the vestments of the Greek Orthodox and Armenian denominations, rival monks threw punches and anything they could lay their hands on. So much for the message of loving thy neighbour or turning the other cheek. The Daily Mash has an amusing twist on the story. There are some people in this world who just don’t seem to understand that they irritate other people. I am not one of these. I know that I annoy lots of people, I know that I am pedantic, sarcastic and occasionally mean. I can be intolerant of views and downright condescending when people do things that go directly against the actions that they could take if they bothered to look at the evidence. People on diets tend to receive my scorn for example. Diets are utterly ineffectual except for temporary weight loss. What is need instead is a change in eating habits for sustainable health in most people coupled with an increase in exercise. People who try diet after diet but lose no weight need to give up diets, go for a walk and eat their greens. This isn’t about diets. This is about people who are annoying but don’t know that they are annoying. Mrs The Pain in our office is one such person. She wrongly believes that everything that she says is cute, funny and amusing. In fact this is rarely the case. Most often what she says is just plain stupid. She also seems to think that the world revolves around her. I got to work this morning with my usual alacrity. I have a modest walk to work of about two miles which usually warms my muscles and gets the blood flowing so my excess heat can be dissipated and I don’t overheat. However Mrs The Pain thinks that I will be freezing cold when I arrive at work because she drives to the door and then sits in a chair gossiping on the phone. Despite assumptions about talking and hot air this doesn’t warm a body much. Mrs The Pain also wears clothing suitable for a central heated house, heated car or summer walk on the beech. She makes no change for approaching winter weather except to turn the radiators on in the office. When I arrive at work it is always uncomfortably hot. Typically it’s 25ºC (77ºF in American) which I would usually consider to be hot. The radiators are all on and the windows are tightly closed. In previous winters I’ve sat down and opened my window till the temperature drops to a more acceptable 21ºC although I’d be happier at 19ºC. I’d take off surplus clothing but I already wear the minimum. Apparently opening a window when you’re too hot is an issue that makes people complain and “piss off to another office” isn’t an acceptable response. I’ve tried underhanded tactics like turning the boiler off and I’ve tried being reasonable but she persists in keeping to her own view that it is too cold so the heating goes on. A compromise would help. I could be a little too warm and she would wear a cardigan, she could leave the heating off and I could leave my window closed. I’ve suggested as much but Mrs The Pain is unmoved. If she is cold then the heating goes on. I’ve even turned the boiler up and the radiators on full and taken the day off so she can experience a day of being far too hot. She doesn’t care. Her view is the only one that matters. Anyway, today I arrive at the office and it’s like a furnace. I hang my coat up and go outside to cool down but comment on the heat politely in the hope that she’ll turn it down a notch. Apparently this means that I am in a bad mood. I wasn’t until I’m told by Mrs The Pain that my being too hot and asking for some consideration in a shared office is a sign of my own bad attitude. Now I’m in a stinking mood and am plotting how to torture, kill and dispose of her corpse. Any suggestions? We don’t need a patio at work so my first plan is out. Such a shame really, no-one would ever think to look under a patio for a body. 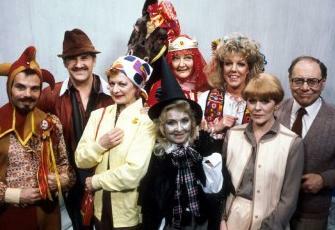 No-one who I work with remembers Rentaghost except for the really old farts. They don’t even know who Metal Mickey is and I’m worried that they might not know about Roobarb and Custard. Well, you’ve probably heard by now that Barack Obama is President elect of the United States. Good for them. It looks like they’ll have a leader who will make some real change to the way they conduct themselves as a world power. With a bit of luck we’ll get swept along too and stop going to war so much and stop colluding in the kidnapping and illegal imprisoning of free citizens in Cuba. Maybe we’ll stop pandering to big business and make an effort to help the people who make this country great and keep big businesses going. Maybe we’ll borrow an energy policy or two from US that will stop us being so reliant on the middle east for oil. Maybe we’ll see Obama’s medicare plan start to work and change the trend of our own NHS so that it is no longer allowed to slowly crumble. Maybe education reform will ignite an interest in England on our own education system so that we have tests to assess learning and not tests to put schools in league tables. Maybe the welfare system will be reformed to act as a safety net for people and not a way of life. We should protect our citizens from hard times, not coddle them so they never seek to rise above our own limitations. A raise in the minimum wage would be a start as would a change to the tax system. Maybe a tax system that takes from those most able to afford it will be borrowed from Obama’s ideals and the average Jo Plumber will have a few quid extra to spend or save for old age, his parent’s retirement or his children’s education. Maybe a separation of Church and state rigorously enforced by the new President will encourage our own government to end the peerage for religious leaders and keep the state and personal faith of her citizens apart for the preservation of both. Maybe the interference in Iraq will end and allied troops will be able to finally withdraw without the nation erupting in civil war and hundreds of thousands more being killed and leaving the people open to the vile hate mongering of the enemies of the West, the Taliban and the message of al Qaeda that paints us as thieves and invaders. Which is true for Iraq at least if not Afghanistan. Maybe our own policy on war will change to reflect Obama’s idea of international cooperation and mutual defence rather than preemptive attacks and occupation. Maybe the idea of equality for race, sexuality and gender embraced by the American people will spur our own flagging ideals a little. Maybe the world will improve just a little because of the good decision of the American people yesterday. Equality suffered a setback slightly today. Proposition 8 defining marriage as an institution between a man and a woman got through 52% to 48%. What that means to 18,000 gay marriages is anyone’s guess.